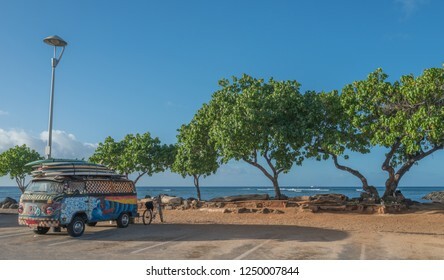 Landscapes, backgrounds, and Hawaiian themes. 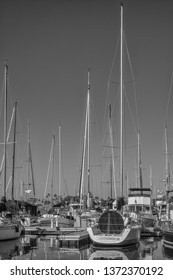 15,012 stock photos, vectors, and illustrations are available royalty-free. 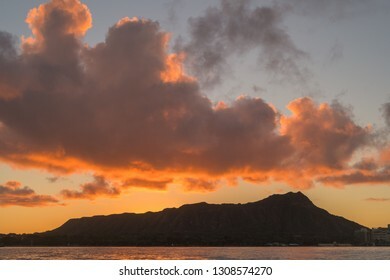 Molten Gold Lava Sunrise at Diamond Head in Waikiki, Hawaii. 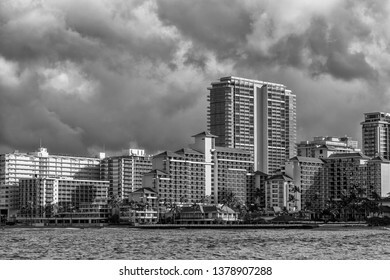 Honolulu, Hawaii, USA. Feb. 6, 2019. 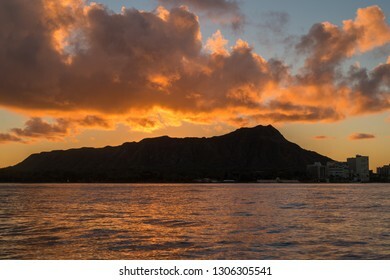 Red and gold dawn silhouetted on the ocean in Waikiki with Diamond Head in the background. 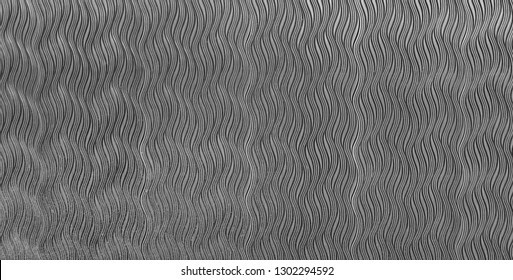 Monochrome Panorama of Metal Swirls on a Backdrop. Silver and charcoal tones with pattern and detail. 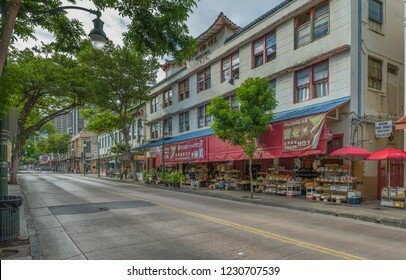 Honolulu, Hawaii, USA. Mar. 15, 2019. Kakaako District condominiums near Ala Moana Beach Park. Honolulu, Hawaii, USA. Mar. 15, 2019. 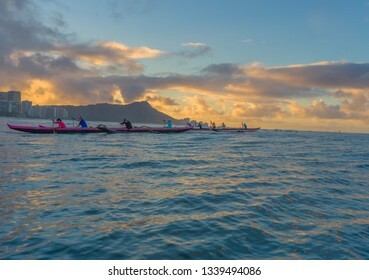 Sunrise Hawaiian outrigger canoe race as surfers watch with Diamond Head Crater in the backdrop. 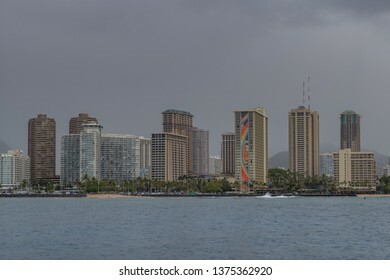 Honolulu, Hawaii, USA. Mar. 8, 2019. 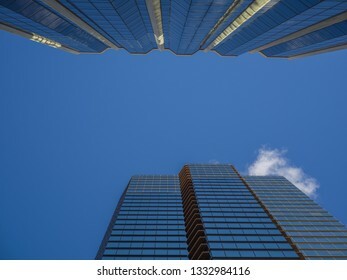 Blue Sky Above Honolulu Skyscrapers. Clear morning in downtown Honolulu as new buildings grow taller. Honolulu, Hawaii, USA. Mar. 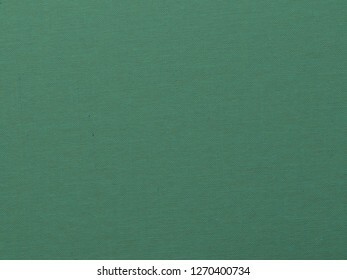 4, 2019. 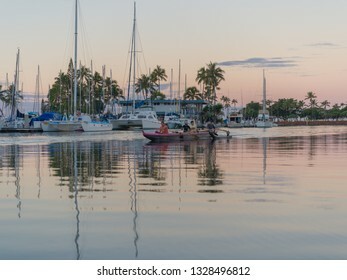 Dawn Hawaiian outrigger canoe practice in the calm waters of the Ala Wai Small Boat Harbor. Honolulu, Hawaii, USA. Feb. 25, 2019. 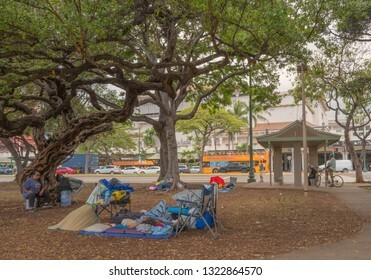 Homeless camp at Ala Moana Park with the luxury shopping center in the background. Millennial Blue Parchment Ad Template. Honolulu, Hawaii, USA. Feb. 18, 2019. 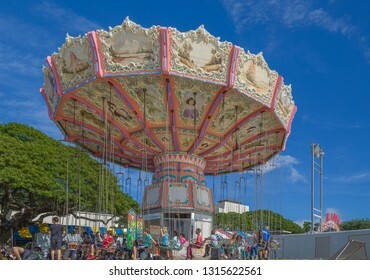 People boarding a thrill ride at the Punahou School Winter Carnival. Honolulu, Hawaii, USA, Nov. 19, 2017. 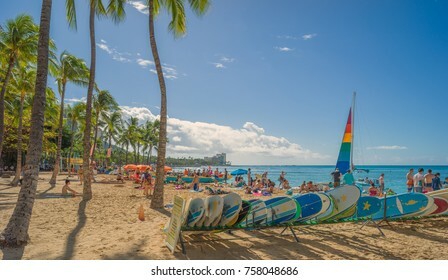 Waikiki Beach scene on a warm Winter morning as tourists and residents gather for a day in the sun and surf. 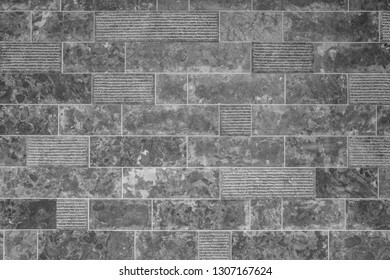 Checkered Black and White Vintage Brick Wall. Backdrop for an Advertising concept. Honolulu, Hawaii, USA. Feb. 7, 2019. 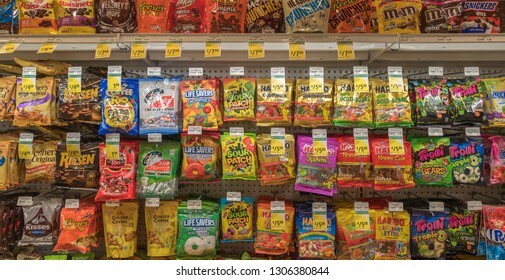 Delicious bags of candy and sweet snacks. Honolulu, Hawaii, USA. Feb 5, 2019. 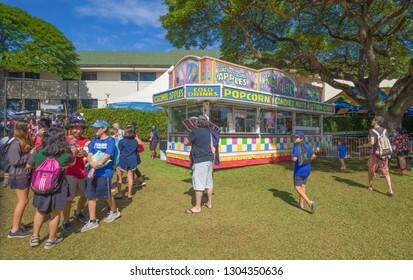 Families enjoying the Punahou School Carnival. Honolulu, Hawaii, USA. Dec. 5, 2018. Beach view of Rockpile Surfing Spot in Waikiki with Kukui Nut Trees growing on the shoreline. 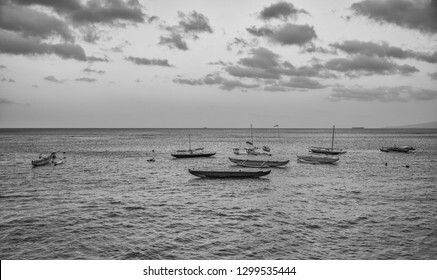 Outrigger Canoes anchored in the shallows along Waikiki Beach. Honolulu, Hawaii, USA. Jan 29, 2019. 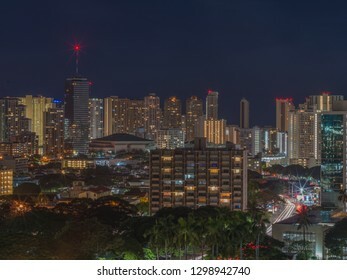 Night view of Makiki District with Waikiki hotels in the background. 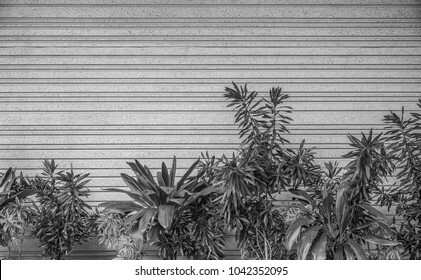 Hawaiian Tropical Plants with Molded Concrete Wall Backdrop. 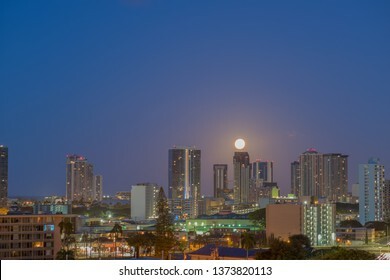 Honolulu, Hawaii, USA. Jan. 23, 2019. Exterior window view of a background at a luxury store in the Ala Moana Shopping Center. 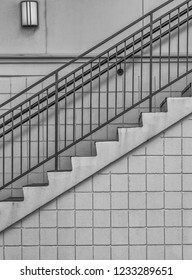 Profile in Monochrome of a Stairway and Light with Iron Railing and Cube Block Construction. 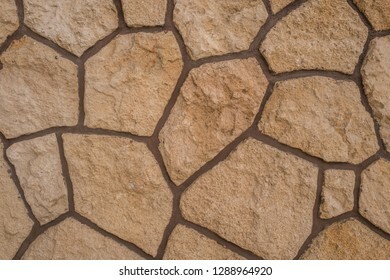 Coral Boulder Wall. White and orange coral rocks with black mortar for an ad backdrop. 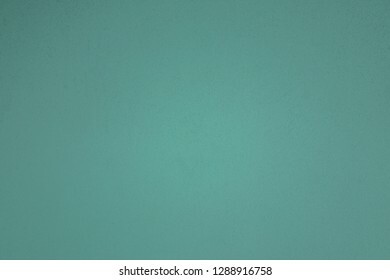 Pale Turquoise and Teal Ad Template. Honolulu, Hawaii, USA. Jan. 17, 2019. 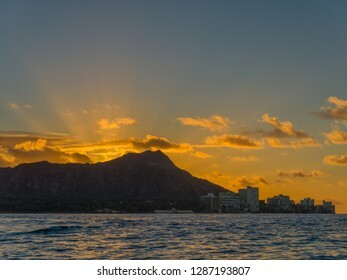 Ocean view of Diamond Head Crater at sunrise on a windy day in Waikiki. Honolulu, Hawaii, USA. Nov. 15, 2018. North Hotel Street panorama in Chinatown as early shoppers buy food. Honolulu, Hawaii, USA. Jan. 16, 2019. 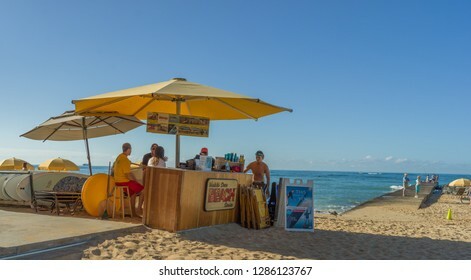 Beach concession stand on the shoreline in Waikiki. 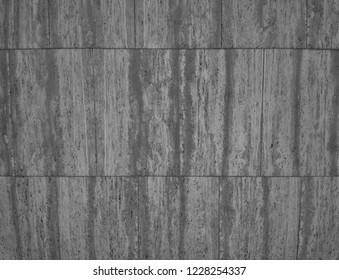 Marble Exterior Blocks with Tones of Black and White. 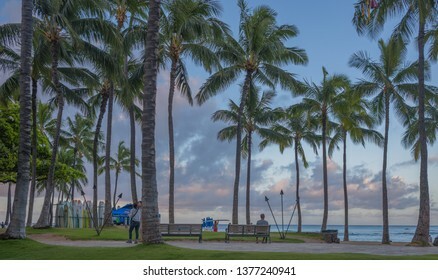 Hawaiian Tropical Lagoon Shoreline. 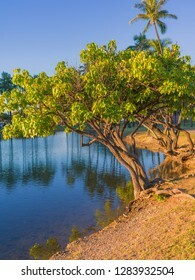 Kukui Nut Tree in the foreground with coconut palm trees fringing the lagoon. Honolulu, Hawaii, USA. Nov. 8, 2018. 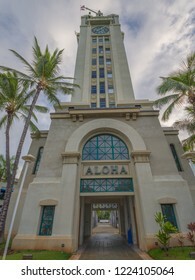 Upward view of the Aloha Tower at the entrance to Honolulu Harbor. 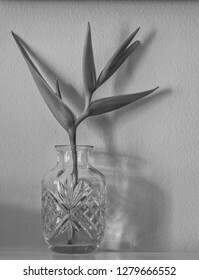 Tropical Bird of Paradise in a Crystal Vase. Black and white photo for use as an ad cover. Honolulu, Hawaii, USA. Jan 8, 2019. 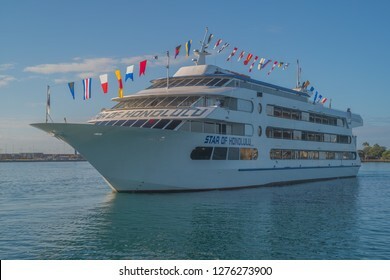 Honolulu Harbor departure of the Star of Honolulu on a whale watching tour. Honolulu, Hawaii, USA. Apr. 24, 2019. 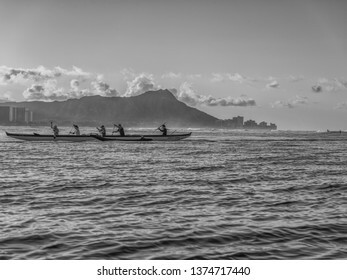 Hawaiian outrigger canoes paddlers in Waikiki at dawn. Honolulu, Hawaii, USA. Apr. 24, 2019. 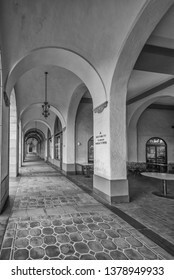 Restored baroque architecture at the Dillingham Building with black and white tones. Honolulu, Hawaii, USA. Apr. 24, 2019. 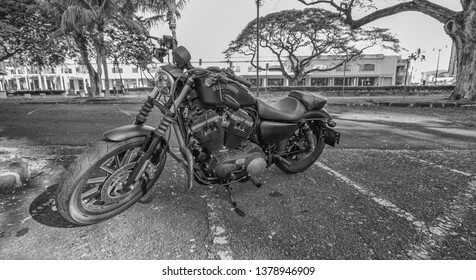 Restored street bike motorcycle in tones of black and white. 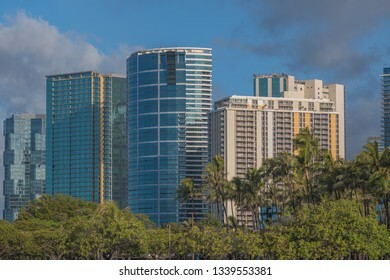 Honolulu, Hawaii, USA. Apr. 24, 2019. Art deco, 1900's mall at the Dillingham building in the Financial District. Honolulu, Hawaii, USA. Apr. 24, 2019. 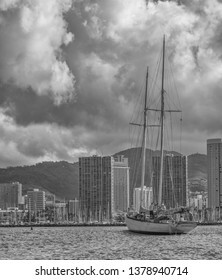 Sailing schooner and crew entering Waikiki at the Ala Wai Harbor after a voyage around the world. 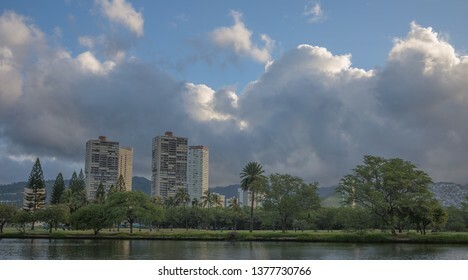 Honolulu, Hawaii, USA. Apr. 24, 2019. 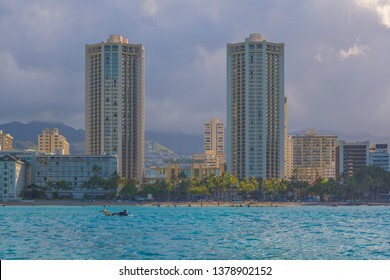 Urban density in Waikiki as new and taller buildings are build on the shoreline. Honolulu, Hawaii, USA. Apr. 24, 2019. 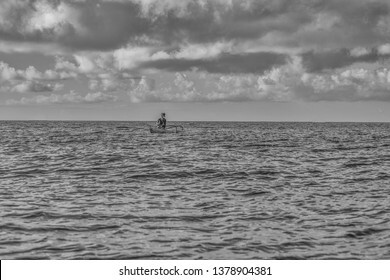 Trade wind morning in Waikiki as a female outrigger canoe paddler enjoys the Ala Moana Channel. Honolulu, Hawaii, USA. Apr. 24, 2019. 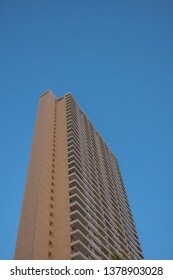 New Waikiki skyscraper condominium against a turquoise blue sky. Honolulu, Hawaii, USA. Apr. 24, 2019. Waikiki morning as tourists enjoy the turquoise water. Honolulu, Hawaii, USA. Apr. 24, 2019. 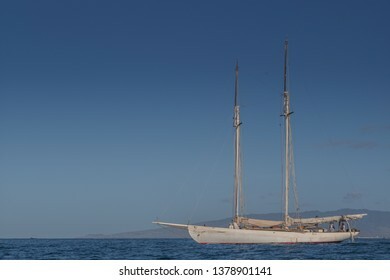 Traditional schooner sailboat leaving the Ala Wai Harbor on a voyage to Tahiti. Honolulu, Hawaii, USA. Apr. 24, 2019. Moonset above the Financial District as an airplane streaks across the sky. Hawaiian Bayan Tree Trunk and Roots. 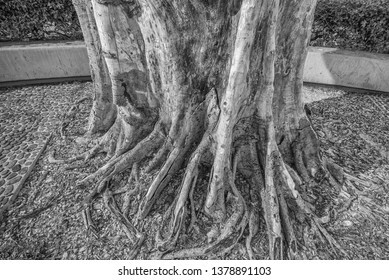 Black and white view of a vintage tree base. Honolulu, Hawaii, USA. Apr. 23, 2019. 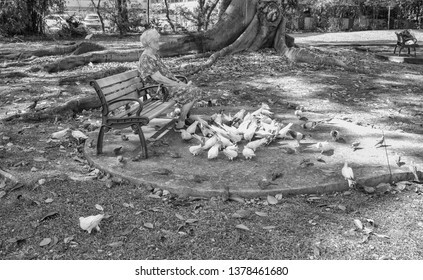 Serenity of old age as a woman feeds a flock of doves from a shady bench. Honolulu, Hawaii, USA. Apr. 23, 2019. New ultra modern luxury condominium in the Kakaako District. Honolulu, Hawaii, USA. Apr. 23, 2019. 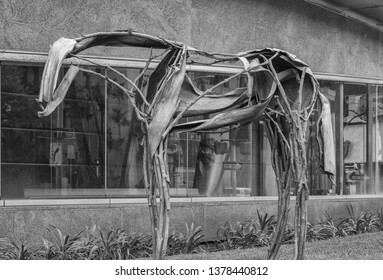 Pale horse statue constructed of palm tree materials and displayed on Bishop Street. Honolulu, Hawaii, USA. Apr. 23, 2019. Late night moonrise above the Manoa Valley District. 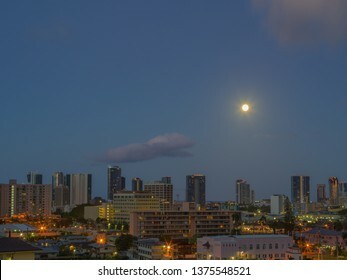 Honolulu, Hawaii, USA. Apr. 23, 2019. 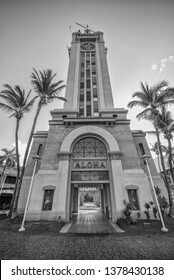 Aloha Tower at Honolulu Harbor with a view through the portal of Fort Street. 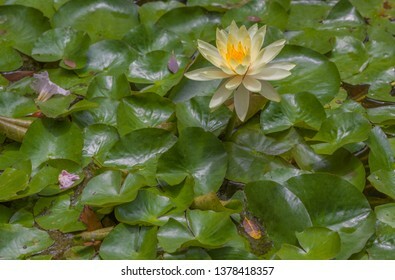 White and Golden Yellow Lily Flower. Ivory white lily surrounded by healthy green lily pads. 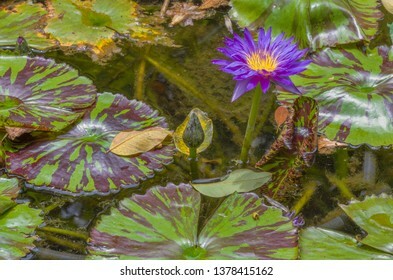 Purple Water Lily With Green Lily Pads. Purple, red, and gold lily bloom surrounded by green lily pads and point of focus on the flower. Urban Trees and Shadows. 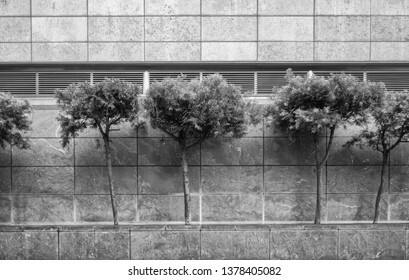 City scene of Japanese fir trees against a marble building wall. Honolulu, Hawaii, USA. Apr. 22, 2019. 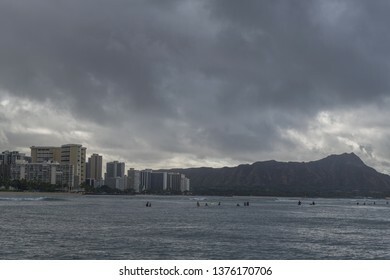 Fast moving tropical storm arrives above Waikiki. Honolulu, Hawaii, USA. Apr. 22, 2019. Sunrise view of the Ala Wai Canal and Golf Course. Steel Skylight . 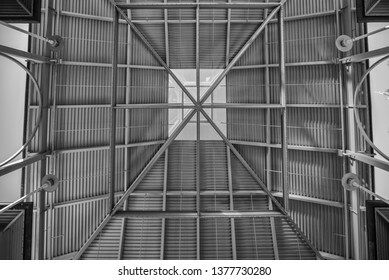 Black and white vertical view of a skylight. Honolulu, Hawaii, USA. Apr. 22, 2019. 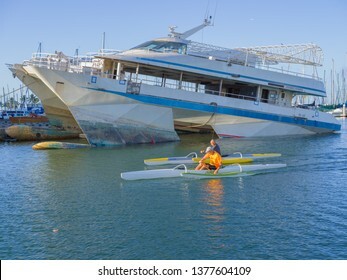 Outrigger canoe paddlers pass a sinking ship in Waikiki at the Ala Wai Harbor as fuel spill continues. 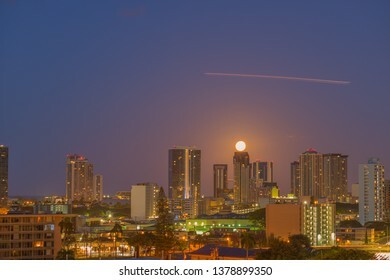 Honolulu, Hawaii, USA. Apr. 22, 2019. Sailing catamaran loading provisions in Waikiki in preparation for a voyage to the South Seas. Honolulu, Hawaii, USA. Apr. 22, 2019. 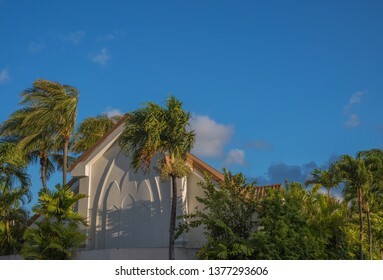 Hawaiian church nestled deep within the Honolulu Rainforest. Honolulu, Hawaii, USA. Apr. 22, 2019. 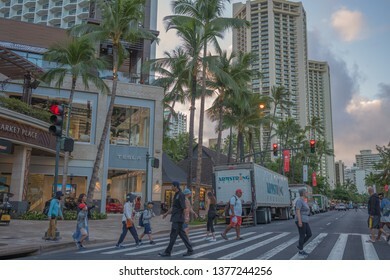 Dawn in Waikiki as daily deliveries arrive to support the large numbers of tourists and vacationers. Honolulu, Hawaii, USA. Apr. 22, 2019. Waikiki sunrise as asian honeymoon tourists explore the beach scene. Honolulu, Hawaii, USA. Apr. 21, 2019. 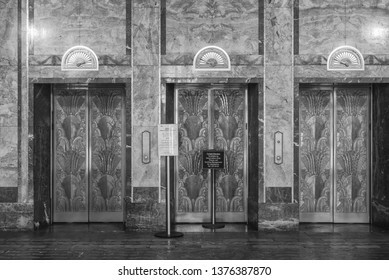 Restored lobby and elevators from 1920 at the Dillingham Building. Honolulu, Hawaii, USA. Apr. 21, 2019. 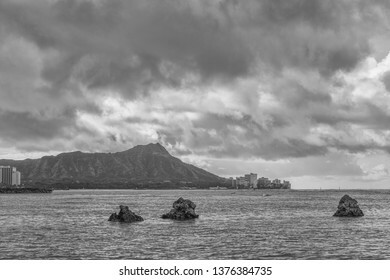 A Trio of coral heads above the water at low tide in Waikiki with Diamond Head and hotels in the background. Honolulu, Hawaii, USA. Apr. 21, 2019. 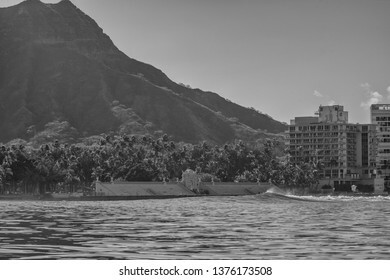 Offshore view of the Waikiki swim stadium with Diamond Head luxury condominiums adjacent. Honolulu, Hawaii, USA. Apr. 21, 2019. Pastel morning at sunrise in Waikiki with surfers on surfboards waiting for a wave and Waikiki in the backdrop. Honolulu, Hawaii, USA. Apr. 21, 2019. 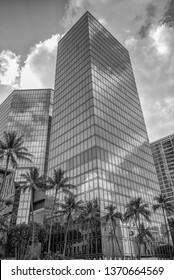 Vertical view of a Waikiki luxury condominium at sunrise with reflected sunlight. 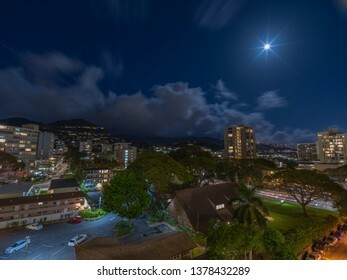 Honolulu, Hawaii, USA. Apr. 21, 2019. 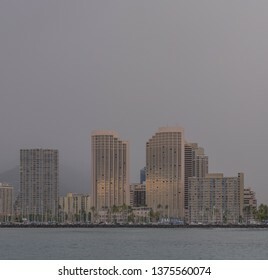 Sunlight breaking through a tropical rain shower and reflecting off the windows of the Prince Hawaii Hotel twin towers. Honolulu, Hawaii, USA. Apr. 20, 2019. Before dawn in the Maliki District as a full moon sets. Honolulu, Hawaii, USA. Apr. 20, 2019. 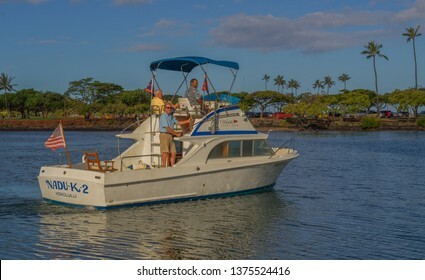 Restored 1950's sport fishing boat with old fishermen in Waikiki. Honolulu, Hawaii, USA. Apr. 20, 2019. 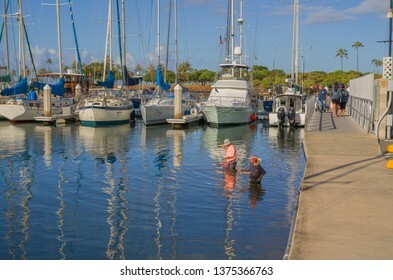 Fishermen enjoying the warm water in the Ala Wai Lagoon. Honolulu, Hawaii, USA. Apr. 20, 2019. 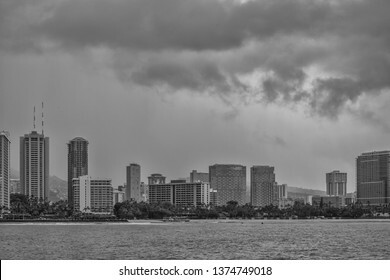 Warm Rain above Waikiki hotels and shoreline. Tropical Rain Storm. 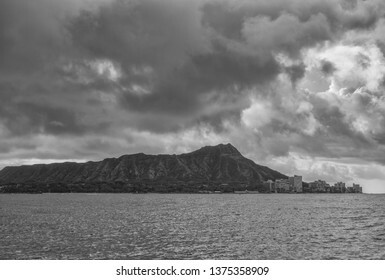 Somber clouds and rain above Diamond Head Crater and Waikiki. Honolulu, Hawaii, USA. Apr. 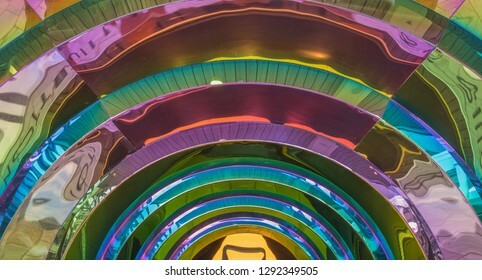 19, 2019. 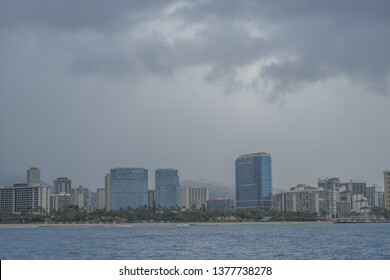 Tropical rain storm above Oahu and moving towards Waikiki on a warm and windy Spring day. Honolulu, Hawaii, USA. Apr. 19, 2019. 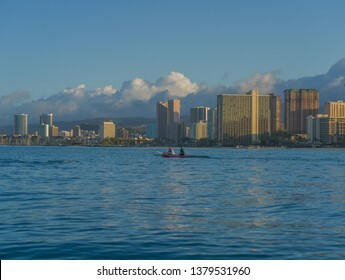 Hawaiian outrigger canoe with Diamond Head and Waikiki in the background. Honolulu, Hawaii, USA. Apr. 19, 2019. 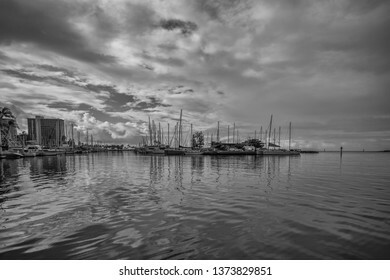 Monochrome dawn at the Ala Wai Harbor in Waikiki with tropical rain clouds above. Honolulu, Hawaii, USA. Apr. 19, 2019. 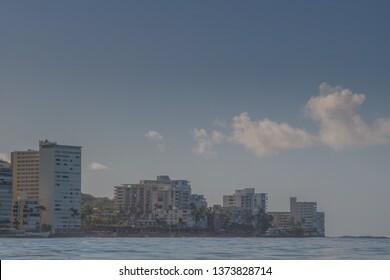 Pale dawn offshore view of Waikiki condominiums with palm trees on the shoreline. Honolulu, Hawaii, USA. Apr. 19, 2019. 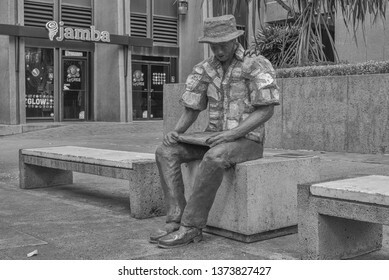 Statue of a man on a bench waiting for a bus and reading the Honolulu Newspaper. Honolulu, Hawaii, USA. Apr. 19, 2019. 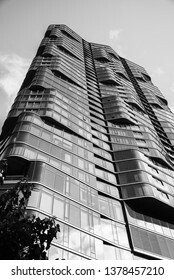 Black and white view of a century old building in the Financial District. Honolulu, Hawaii, USA. Apr. 19, 2019. Nearly full Spring moon setting above downtown at an hour before dawn. Honolulu, Hawaii, USA. Apr. 18, 2019. 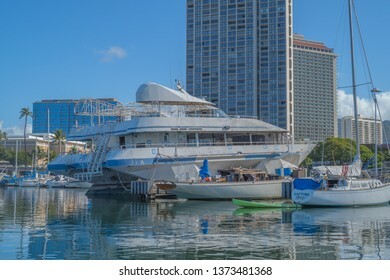 State of Hawaii impound docks in the decaying Ala Wai Harbor in Waikiki. Honolulu, Hawaii, USA. Apr. 18, 2019. 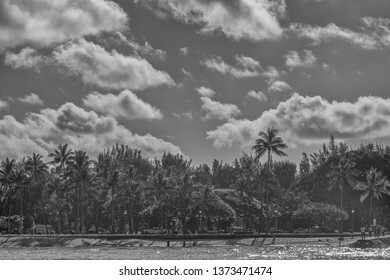 Black and white offshore view of Queen's Beach in Waikiki. Honolulu, Hawaii, USA. Apr. 18, 2019. 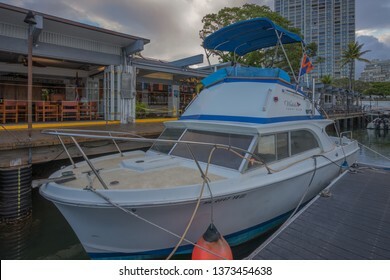 Restored 1950's cabin cruiser with the Waikiki Yacht Club in the background. Honolulu, Hawaii, USA. Apr. 18, 2019. 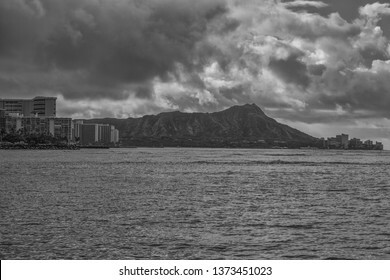 Monochrome view of Waikiki under trade wind rain showers with Diamond Head in the backdrop. Honolulu, Hawaii, USA. Apr. 18, 2019. 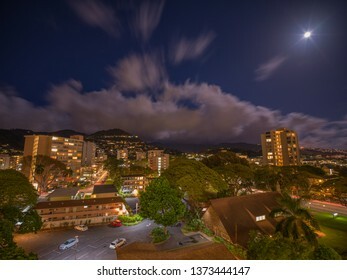 Night time lapse view of fast moving clouds and a rising full moon above Manoa Valley. Honolulu, Hawaii, USA. Apr. 17, 2019. 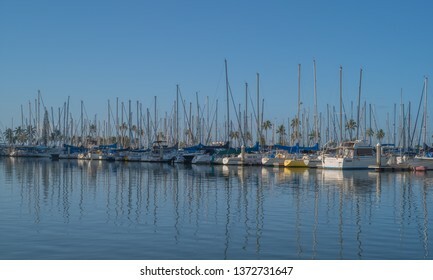 Yachts reflected in the calm turquoise waters in Waikiki. Honolulu, Hawaii, USA. Apr. 17, 2019. 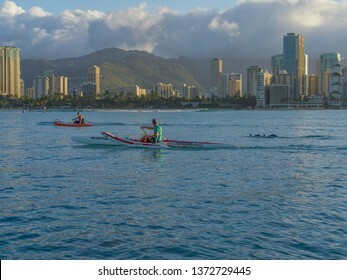 Two Hawaiian outrigger canoe paddlers accompanied by Pacific spinner dolphins as they paddle through Waikiki. Honolulu, Hawaii, USA. Apr. 17, 2019. 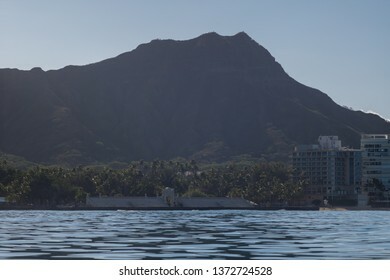 Ocean view of the Waikiki Natatorium and Swim Stadium with Diamond Head in the background. Honolulu, Hawaii, USA. Apr. 17, 2019. 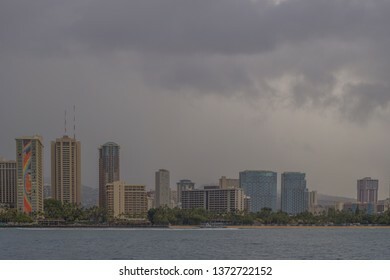 Offshore Waikiki panorama as a Spring trade wind shower engulfs the island. Honolulu, Hawaii, USA. Apr. 17, 2019. 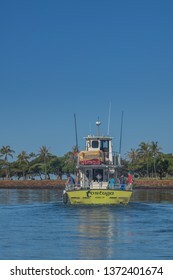 Tourists leaving the Ala Wai Harbor on a fishing boat enroute to Waikiki. Honolulu, Hawaii, USA. Apr. 17, 2019. 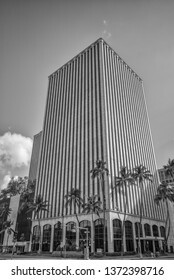 Black and white profile view of a Honolulu skyscraper with tall coconut palm trees in the foreground. Honolulu, Hawaii, USA. Apr. 17, 2019. 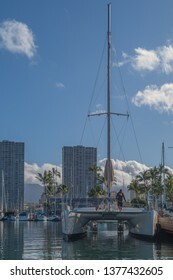 New racing sailboat at the Waikiki Yacht Club ready for the 2019 Transpacific Yacht Race. Honolulu, Hawaii, USA. Apr. 17, 2019. 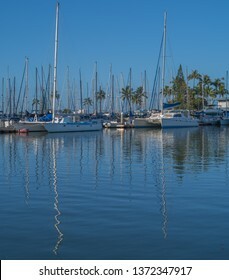 Two large catamarans Ala Wai Harbor. Violet Advertising Template with Texture and Detail. 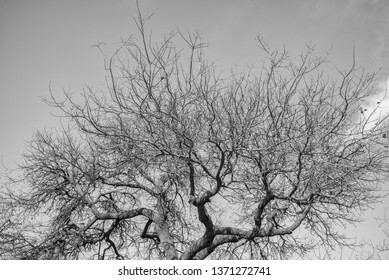 Winter Sky with Barren Tree. Harsh perspective view of a Winter day. Chrome Steel Backdrop. 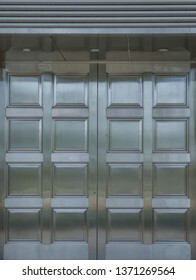 Polished wall of stainless steel for use as a template. Glass and Steel Skyscraper Corner. 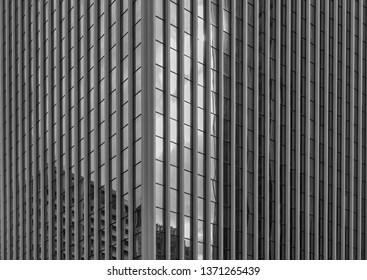 Black and white study of a reflective glass building with clouds and sky reflected. 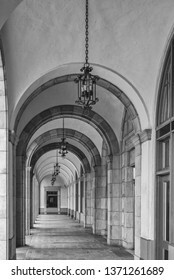 Antique Archway with Chandeliers. 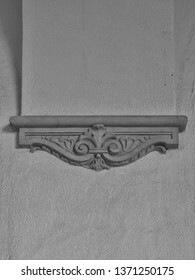 Monochrome profile of a centuries old archway design. 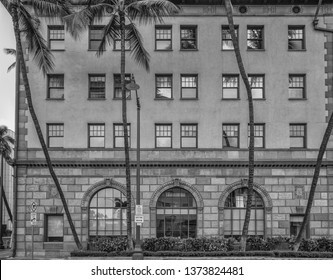 Black and White Art Deco Building Facade. 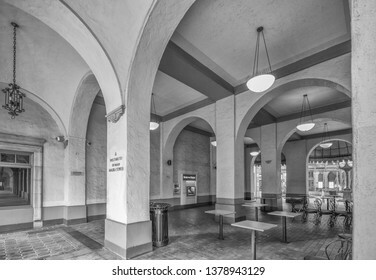 Turn of the century stucco design on an arched building with room for copy. 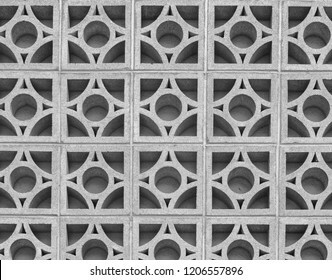 Concrete Geometric Cinder Block Wall. Honolulu, Hawaii, USA. Apr. 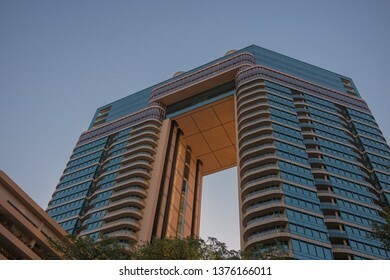 16, 2019. Financial District new glass skyscrapers with tropical palm trees and sunny skies.